This is a pattern for Baby Tugs Care Bear. He, along with her companion Baby Hugs Care Bear, were made as gifts to some friends that recently welcomes twins, one boy and one girl, into this world. Rd 19: sc in each sc around placing a marker around st #12, slip st in next sc. Rds 1-18: Work same as FIRST ARM. Rd 19: sc in each sc around placing a marker around st #1, slip st in next sc. Rd 20: sc in each sc around placing a marker around at #7. Rds 1-16: Work same as FRIST LEG. Rd 20: sc in each sc around placing a marker around st #7. Joining LEGS, ARMS, and MUZZLE to BODY involves several Rds; LEGS – Rds 9 thru 13; ARMS – 25 thru 26 and MUZZLE – Rds 34 thru 37. Rd 9: sc in next 23 sc, 2 sc in next sc, holding FRIST LEG and BODY with right sides together, matching marked sc on FIRST LEG with next sc on BODY, and working through both thicknesses, sc in next 6 sc, leave remaining 10 sc on FIRST LEG unworked, working in sc on BODY, sc in next 4 sc, 2 sc in next sc, sc in next 5 sc, holding SECOND LEG and BODY with right sides together, matching marked sc on SECOND LEG with next sc on BODY, and working though both thicknesses, sc in next 6 sc, leaving remaining 10 sc on SECOND LEG unworked, working in sc on BODY, 2 sc in next sc, sc in next 8 sc. Rd 10: sc in next 25 sc, sc in next skipped sc on FIRST LEG, working in sc behind same leg, sc in next sc, ch 4, skip next 4 sc, sc in next sc, skip next 8 unworked sc on same leg, sc in next sc, sc in next 11 sc on BODY, sc in next unworked sc on SECOND LEG, working in sc behind same leg, sc in next sc, ch 4, skip next 4 sc, sc in next sc, skip next 8 unworked sc on same leg, sc in next sc, sc in next 10 sc on BODY. Rd 11: sc in next 7 sc, 2 sc in next sc, sc in next 16 sc, sc2tog, sc in next skipped sc on FIRST LEG, working in sc behind same leg, sc in next sc, ch 3, sc in next sc, skip next 6 sc on same leg, sc in next sc, sc2tog on BODY, sc in next 9 sc, sc2tog, sc in next skipped sc on SECOND LEG, working in sc behind same leg, sc in next sc, ch 3, sc in next sc, skip next 4 sc on same leg, sc in next sc on same leg, sc2tog on BODY, sc in next 9 sc. Rd 12: sc in next 8 sc, 2 sc in next sc, sc in next 18 sc, sc in next skipped sc on FIRST LEG, working in sc behind same leg, sc in next sc, ch 2, sc in next sc, skip next 4 sc on same leg, sc in next sc, sc in next 13 sc on BODY, sc in next skipped sc on SECOND LEG, working in sc behind same leg, sc in next sc, ch 2, sc in next sc, skip next 4 sc on same leg, sc in next sc, sc in next 11 sc on BODY. Rd 25: holding SECOND ARM and BODY with right sides together, matching marked sc on SECOND ARM with next sc on BODY, and working through both thicknesses, sc in next 3 sc, sc in next 16 sc on BODY, holding FIRST ARM and BODY with right sides together, matching marked sc on FIRST ARM and next sc on BODY, and working through both thicknesses, sc in next 6 sc, leaving remaining 9 sc on FIRST ARM unworked, sc in next 12 sc, holding SECOND ARM and BODY with right sides together 3 sc before starting sc on SECOND ARM and BODY, working through both thicknesses, sc in next 3 sc, slip st in next 3 sc. Will end round 3 sc passed beginning sc. Rd 34: sc in next 6 sc, sc2tog, sc in next 11 sc, sc2tog, sc in next 17 sc, holding next sc on BODY and first sc on MUZZLE together and working through both thicknesses, sc in next 6 sc, leave remaining 14 sc on MUZZLE unworked, sc in next 10 sc on BODY. Rd 35: sc in next 27 sc, sc2tog, sc in next 7 sc, sc in next skipped sc on MUZZLE, working in sc behind MUZZLE, sc in next sc, ch 4, skip next 4 sc, sc in next sc, skip next 12 sc on MUZZLE, sc in next sc, sc in next 8 sc on BODY, sc2tog. Rd 36: sc in next 35 sc, pull up loop in next sc on BODY and in next skipped sc on MUZZLE, YO and draw through all loops on hook (counts as one sc), working in sc behind MUZZLE, sc in next sc, ch 3, sc in next sc, skip next 10 sc in MUZZLE, pull up loop on next sc on MUZZLE and in next sc on BODY, YO and draw through all loops on hook (counts as one sc), sc in next 9 sc. Finish off leaving a long tail. Weave tail through sc of Rd 49, pull tightly and secure. Weave in ends. Finish off leaving a long tail. Sew to BODY. Finish off leaving a long tail. Flatten and sew to BODY. Rw 6: Ch 1, turn; skip next 2 sc, 5 dc in next sc, skip next sc, slip st in next sc, skip next sc, 5 dc in next sc, skip next sc, slip st in next sc. Rd 1: Sc around outside edge of heart with 3 sc in bottom point. Finish off leaving a long tail. Sew to perspective places on BABY TUGS CARE BEAR. To shape toes, thread yarn needle with cut ends of a doubled strand of soft pink. Insert needle through sole at first toe position and go through until loop protrudes from foot. Bring yarn over top of foot to form toes and insert needle through loop, pull tightly. Insert needle back through foot on outside of loop to secure and bring needle out at second toes on sole. Bring thread over foot and insert needle through instep and go straight through foot and out sole at same point, pull tightly. Take a couple of very small stitches to secure insert needle inside the foot and push it out the bottom so the yarn does not show, cut the end close to the foot. Use tip of needle to pull stuffing into toe areas and shape foot. Rw 11: ch 1, turn; sc in next 2 sc, sc2tog. (3) Do not finish off. Sc around outside edge of heart with 3 sc in bottom point. Embroider eyes on CARE BEAR. Use detail color for accent around pupil. Embroider eyebrows using detail color. 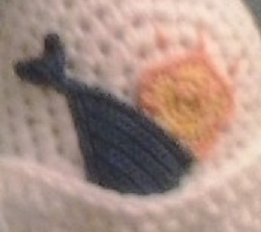 Embroider mouth using detail color. Finish off. Weave in ends. Sew free loops of foundation ch together. Rw 1: Attach white in side of Rw 16, ch 20, sc in second ch from hook, sc in next 18 ch, working in side of Rws, sc in next 32 Rws, ch 20, sc in second ch from hook, sc in next 18 ch, slip st in first sc of Rw 16. Finish off. Weave in ends. Repeat on the other side of DIAPER. 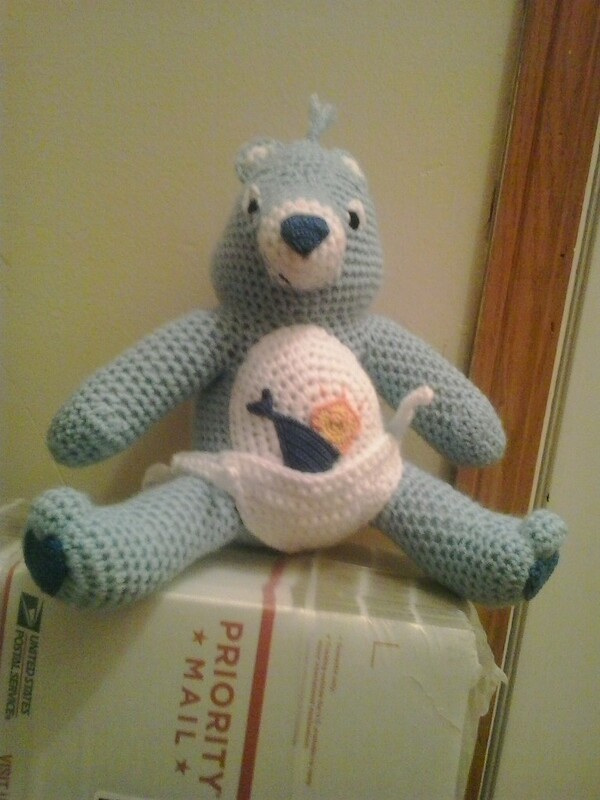 Place DIAPER on BABY HUGS CARE BEAR and tie together. Rd 11: Ch 1, working in side of Rws, sc in next 10 Rws, working in free loops of foundation ch, sc in next 3 ch, Sc in next 10 Rws, ch 9, sc in second ch from hook, hdc in next ch, dc in next 2 ch, hdc in next ch, sc in next ch, ch 7, sc in second ch from hook, hdc in next ch, dc in next 2 ch, hdc in next ch, sc in next ch, sc in next 2 ch of original ch-9, sc in side of last sc before ch-9, sc in next 16 sc of Rw 10, slip st in first sc. Rd 3: Ch 1, [sc in next sc, (hdc, dc) in next sc, ch 1, (dc, hdc) in next sc] around, slip st in first sc. Rd 4: With right side facing, attach #741 in any ch-1 space, ch 1, sc in same sc ch-1 space as attachment, sc in next 2 sts, exsc in next sc, sc in next 2 sts, [(sc, ch 1, sc) in next ch-1 space, sc in next 2 sts, exsc in next sc, sc in next 2 sts] 4 times, (sc, ch 1) in same ch-1 as attachment, slip st in first sc. Finish off leaving a long tail. Using #741, embroider face on STAR. Using photo above, sew BELLY DETAIL pieces to BELLY. Sew BELLY to BABY TUGS CARE BEAR adding a small amount of stuffing before closing. Baby Hugs Care Bear, Baby Tugs Care Bear, Care Bear are copyright Those Characters from Cleveland, a division of American Greetings Entertainment, and their respective creators. This crochet pattern is an original pattern by Christjan Bee (May 2018). Please do not claim this pattern as your own. If you wish to share this pattern, you may link to this pattern but please do not reprint it on your site. You may keep a copy for your own personal use, but you may not sell or distribute it, or sell items made from this pattern.